"Is this going to hurt? Better not look. Hope he doesn't take too long." 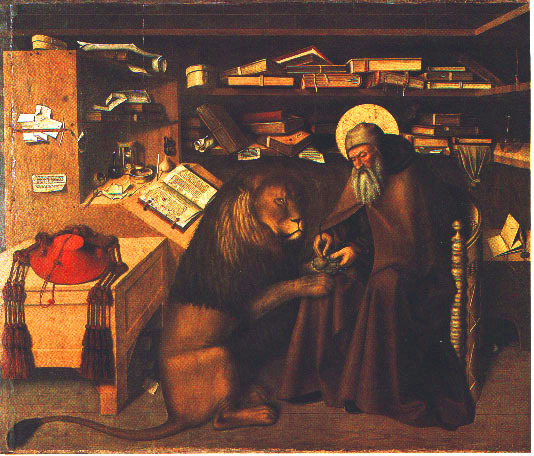 The painting is part of an altarpiece and all around Jerome are the tools of his trade as a scholar, linguist, theologian, translator and interpreter of Scripture. There is also a red cardinal's hat which is just one of several anachronisms in the painting. There were no cardinals of the church when Jerome lived in the 4th - 5th century. He was a priest, but one who only agreed to be ordained on condition that he did not have to carry out priestly functions. Jerome ( Eusebius Sophronius Hieronymus) is best known for his work in translating a substantial amount of the Bible from Greek and Hebrew into Latin which had become the universal language of the western part of the Roman empire, at least among its educated inhabitants. Jerome is commemorated today 30 September in Anglican and Catholic churches. 30 September 420 AD is the day he died in Bethlehem where he lived for his last few years. You can read more about his translation work in 'Jerome, Translator of the Scriptures, Teacher' and more generally about his life in 'Jerome'. Jerome's translation work on the Bible was foundational to the Vulgate, the complete and official Latin translation in the western Catholic church for about a 1000 years. When John Wycliffe translated the Bible into English he did so from this version as did Martin Luther when he translated the Bible into German. It is only in relatively recent history and with access to more of the ancient texts that scholars have returned to the principle established by Jerome of using the ancient texts in their original languages as the basis for translation and to translate 'sense for sense' so the meaning can be more clearly understood rather than literal word for word which can obscure its meaning. Jerome saw the Scriptures as pointing to Christ and therefore worth meditating on. This prayer is attributed to him by some people. I really do not know if this was his prayer or not, but it is a good prayer.